We have already discussed a method to identify hidden password in asterisk .This method needs to get the asterisk keys from the target to recover the password .Here is a method to recover Yahoo messenger 9 ,ICQ , Windows Live Messenger , Google talk passwords using some data files in your computer . Msgrkey or messenger key is completely free and lightweight Windows application . 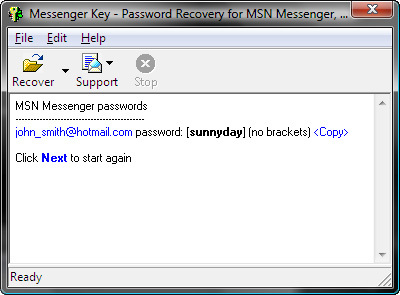 Download Msgrkey and recover Yahoo ,ICQ , MSN Google talk passwords. Recover Yahoo ,ICQ , MSN Google talk passwords. After installation , select the required messenger from Messenger key interface . Now a dialogue box opens to select the data base file for that particular messenger . Search for the file if you don’t know the exact location of messenger database file . Now Messenger key will display the password in its interface as shown above . Download MsgrKey and recover Yahoo ,ICQ , MSN Google talk password. I have ever purchased a recovery toolkit named Password Recovery Bundle from top-password.com, it can recover more types of passwords than Messenger Key, despite it is not free, but the price is cheap any way.